NOW the dreams are beginning to settle and she is with him again in the depth of sleep, advising and smiling, as she always did, tugging him a little towards the more romantic vision of life. But then there is the loneliness, the silences when there should be talk, comfort and laughter, and so many new ideas to unfurl before their friends. Friends is a hard word for him because that is what they were, Tony and Vicki Moore, husband and wife, a cabaret duo, a pair of buddies bonded by spirit and belief. But she has gone and, when he talks about her, Tony feels a moment of guilt. "Doesn't everyone feel the same when they lose someone?" he asks, "What's so special about me?" The question troubles him. But the moment passes, because deep down he knows that she was special, his feelings are true. 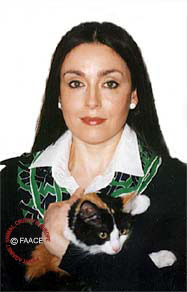 This was his brave girl with hazel eyes and auburn hair, whose campaigns to stop people being cruel to animals gained respect around the world. And this brings Tony to another problem. There was the Vicki he loved and held so often, and the Vicki who belonged to others. To the thousands who watched her trying to persuade swaggering young Spaniards that there was no bravery, no honour, in tormenting a bull or decapitating a hen hanging helpless from a line, she was simply the animal lover and the martyr to her faith. And Tony knows that the injuries sustained, when she was tossed like a flannel and gored by a bull at the torture fiesta, which she was trying to stop in Coria, near the Portuguese border, contributed directly to her death five years later. For, after her early lifesaving treatment, Vicki ignored the steady growth of a lump in her stomach. She was determined that it shouldn't interrupt her work. When, finally, she accepted the need for surgery, her small body was weak and there were complications; resulting in death. She was 44. That was the world's Vicki, the courageous and tempestuous woman, who, even in her greatest pain, would not blame the bull. After all the baying crowd had exploded a firework under him and poured water on his head in the moments before the tragedy. What do you expect when you treat a creature like that? Tony remembers how, as she regained consciousness, he told her that the bull had been called Argentina. 'Don't Cry for me, Argentina' was a song that they had sung, many times, with Tony playing the guitar. Some people understand the ironies of this life. And Vicki was one of them. You could see that in the weary little smile in her eyes. What had they done to Argentina, she wanted to know. He had been shot. OF course, Tony knew Vicki the animal campaigner, but to him she was also the singer who could belt-out a big ballad with enough gusto to shake the walls of a cathedral, the lover of literature, the wit, the philosopher, and the Shakespearean actress who had the style to work in a Southport night club in a bunny girl costume. That was how they met, when she was serving the tables at his brother David's stag night in 1973. "I fell for her there and then," he said. "It was instant attraction. Vicki said that she felt the attraction as well, but she disguised it very well. She was good looking, but there was something else underneath that, which I saw immediately. There was an inner beauty. That sounds a bit trite, but there was something shining out." At the time, Tony thought that Vicki was a little under the thumb of her mother Louise, who had been a professional ballet and show dancer. "Vicki had lots of ideas but she wouldn't push herself," he said. "I used to tell her to be herself and if she wanted to do something, to do it, even if it was against what I wanted to do, 'Have a row with me, but do it. ', I would tell her." Tony's own self-will had hardened when he was a young man in the Lake District. He had been taken fox-hunting because that was what people from his background did. One day, he became separated from the rest of the hunt and saw the fox approaching, black and wet with sweat, its tongue hanging out. The hounds were down in the dale. "I should by rights have hollered them up, but I couldn't," he said. "I looked at the fox and said to myself, no'. What we were doing was very wrong. I didn't make a big stand at the time, but I stopped going to hunt balls and everything like that, and I started speaking against it." Vicki, too, was just a girl who was fond of animals. Like most people she disapproved of cruelty, but it hadn't reached beyond that. The first animal they had was a stray dog found on Southport beach. Despite treatment, he was desperately ill with distemper, so the three of them lay together on the tiles of the kitchen floor, where slowly the dog died. "That is what started us doing something positive for animals, rather than just helping an animal when it was in trouble, like most people would," Tony said. He is talking in his flat in Shakespeare Street, Southport, above the shop which helps to support Fight Against Animal Cruelty in Europe, the charity that Tony and Vicki founded in 1987. Soon after their marriage, 14 years before, Vicki, who had enjoyed some success as an actress, and Tony formed a duo. They began performing in cabaret clubs, winning a big enough reputation to find work across the world. But the dramatic change was to come for this couple, whose campaigning until then had been limited to membership of the local RSPCA committee. "Vicki said to me one day, 'I've got to do something about bullfighting'," recalled Tony. "She didn't even know why she had said it, but there was some strange drive behind it." That drive, which was to swell into a religious conviction, found its first outlet in 1987, and it was provided by a donkey, not a bull. 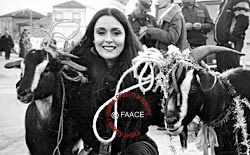 With the help of the world's press, she was able to rescue Blackie from a Spanish fiesta where he was to have been crushed to death. Vicki felt that her initiation into the manner of these perverted festivals was an invitation to "carry the cross called conscience". A few months later she saw a bound bull with its horns aflame dragged by a screaming mob to its death down the Calle de Calvary in Canet de Berenguer. He had been tortured for hours. Death became his sanctuary. Tony shows some of the video films and photographs, that he and Vicki made at great personal danger, featuring unprintable atrocities committed against bulls, donkeys, goats and chickens in Spain. These have been shown to politicians in the European Parliament as well as the lawmakers in the Spanish regions. As a result, some of the ceremonies have been banned and others modified to spare the animals a little of the degradation and pain that they had previously endured for the amusement of people. Many of the fiestas, though, continue, often claiming some entirely spurious Christian symbolism as their justification. Sometimes it seemed to Tony that the laughter had been taken from Vicki. After her terrible injuries, the campaign became an obsession as her compassion for the animals deepened. But then, as before, they would look to each other and smile, touching some memory from a faraway place. "She used to tell me that she had to be this very sombre person because she was always talking about such terrible things, but she didn't think that sombre person was her at all. It did become an obsession. We would be talking about the theatre, or something one of us had read, and then in a second, bang, we would be deciding what we were going to do next. Yes, it was an obsession, but not a bad one." Did Tony feel any anger about Vicki delaying the treatment which could have saved her? "I don't know what my emotion is. Sometimes I feel guilty because I should have forced her to have the treatment, but she wouldn't be forced. That wasn't the way we were. I feel as though I am weighing her up in some way, saying she was this and she was that. But she really was one in a million. I was very much in love with her and she was in love with me. We were as one. It is a shame that she died when she did, especially with things starting to move in such a wonderful way now. 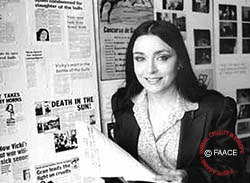 She was the woman who started the animal rights revolution in Spain. In a strange way, her death has been a catalyst for these things. But that is the last thing I would have wanted to happen. I would rather nothing had happened and we had just got on with our lives. I just want her to be here, with me." Their cats Tolly, Thomas Chip, Tiny and Alita are prowling the room. He loves them all. Vicki and Tony didn't have children. Their lives together had been dedicated to saving the animals of Spain from torture and abuse. To that purpose, they worked as a team with responsibilities overlapping. Tony did more of the background organizing and Vicki the investigating. "The memories I have of Vicki now are of the last days, which is sad," Tony said, "But the other ones, the happier ones, are beginning to creep back - when we had a gay and carefree life on board cruisers, having lovely times and having successes in our other work. I am starting to dream about her now. The awful thing is that you wake up and she is not there. For a split second I try to speak to her, then she's gone. But I feel her here still, in my mind."